Natural stone, specifically granite is one of the most beautiful and durable options available for all your counter top needs. Finally a beautiful and modern facility on the Western slope ready to provide all your natural and engineered stone needs. When you first walk into our beautiful new facility you'll find a variety of modern and traditional kitchen and vanity displays which will give you many ideas about color combinations of cabinets and counter tops! Then proceed on to the bright warehouse area with an abundance of natural and indoor lighting which will aluminate the more than 1000 slabs we have in stock. Whether you are looking for granite, marble, travertine, natural quartzite, soapstone, sandstone, limestone, onyx or engineered stone you will be sure to find something amazing. But no limited to just slabs we also stock a variety of tiles, sinks and sealing products. Natural stone provides the unique and exotic elegance that only mother nature can provide! Our slabs can be used for many applications such as kitchen counter tops, bathroom vanity tops, showers, tub surrounds, flooring, fireplace surrounds, bar tops, table tops and much more. No project is too large or too small to consider stone, of course we can accommodate any large project but also with our half slab program it's more affordable than ever if you are considering a single vanity or bar top! How this will save you money is you will not have to buy a full slab, just browse our many colors available in half slabs and save! 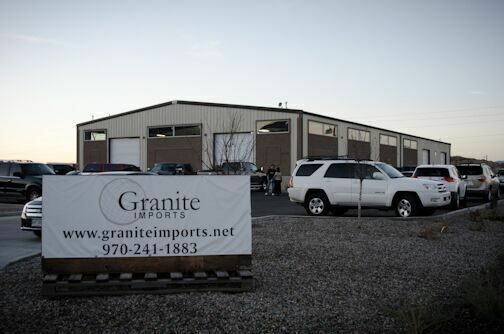 Granite Imports Grand Junction is conveniently located just 2 miles off the interstate at 2378 Leland avenue. We service the entire western slope from Craig to Cortez and all points in between. Even if you are coming from Eagle, the Aspen valley or Glenwood Springs our GJ location is very convenient and easy, especially in the winter, no high mountain passes to negotiate! We offer FREE delivery to the fabricators throughout western colorado and the western slope. Come visit our brand new 12,000 square foot showroom/warehouse. Our showroom is opened Monday through Friday and we also offer Saturday hours if you cannot get away during the week. We are here to assist you with any questions, concerns or design recommendations you may need when pulling together that special project to beautify and enjoy in your home for many, many years to come! Our inventory updates daily as new selections arrive. Find the right team for your project with any of our top fabricators at one of our three showrooms.